Nine Mile Falls Elementary is committed to promoting kindness and compassion so our school remains a safe place to learn and grow. 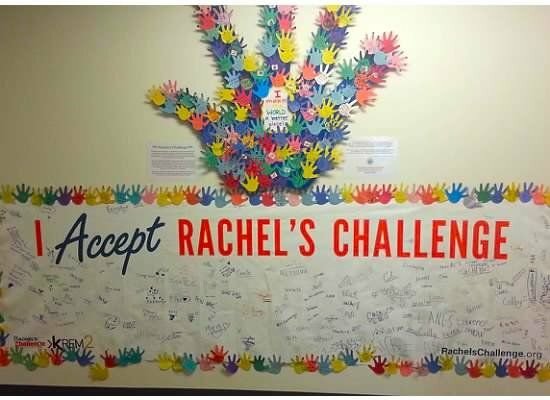 Rachel Scott left behind an amazing legacy and a simple challenge to look for the best in others, dream big, choose positive influences and start a chain reaction of kindness. We learned that Rachel drew a hand on the back of her dresser and it reads, “These hands belong to Rachel Joy Scott and will someday touch millions of people's hearts”. At Nine Mile, we have created our own hand to symbolize Rachel's mission. Each hand represents an act of kindness and compassion committed by a student, staff member or a member of the community. Every time a student or staff member gets recognized for their act of kindness, we add it to represent how together, as a community, we will start a chain reaction that will change the world. Mr. Kurt Kimberling and his 7th grade Tech classes. We worked together to create and construct this amazing project from start to finish. With their help and hard work, they gave our idea life! They have given us a gift that symbolizes the power of love, kindness and compassion. This hand represents how together, as a community, we can start a chain reaction that will change the world. committed citizens can change the world.